The first ever meeting with the United States Air Force Academy highlights the 2017 VMI football schedule. The Keydets will travel west of the Mississippi River for only the second time in program history and face Air Force in Colorado Springs, Colorado for the 2017 season opener on Saturday, September 2. VMI head coach Scott Wachenheim, who will be starting his third season at the Institute, is a 1984 graduate of the U.S. Air Force Academy. Five home games at Foster Stadium are on the slate for 2017 with the home opener scheduled for September 9 against Catawba. It will be the first game between the two schools since the 1990 season opener and 10th time overall. VMI will open its Southern Conference schedule at Foster Stadium against Chattanooga. SoCon foes Samford (Sept. 23), Western Carolina (Oct. 21), and Wofford (Nov. 11) will also visit Lexington. The Keydets will travel to Robert Morris September 16 for the first time since 2007 and it will be the first game between the schools since the 2013 season when the Colonials visited Foster Stadium. 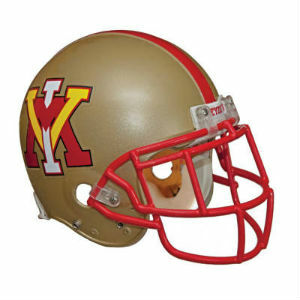 VMI will also make its first trip to Johnson City, Tennessee since 2002 to play ETSU on November 4. “The Military Classic of the South” between VMI and The Citadel will take place on October 28 at Johnson Hagood Stadium in Charleston, South Carolina. Tickets for the 2017 season will go on sale in mid-summer. Go to www.vmitickets.com for more information.